BELFAST, MAINE -- 09/14/2016 -- The Maine state flag waves in a breeze outside Troy Howard Middle School in Belfast. Maine faces a major demographic challenge: It has a declining number of younger people entering the workforce. To power the economy even at its current level, the state will need more people who aren’t currently working to work, in addition to drawing workers from outside state lines. How can Maine generate productive workers within its borders and make itself more attractive to people outside the state? 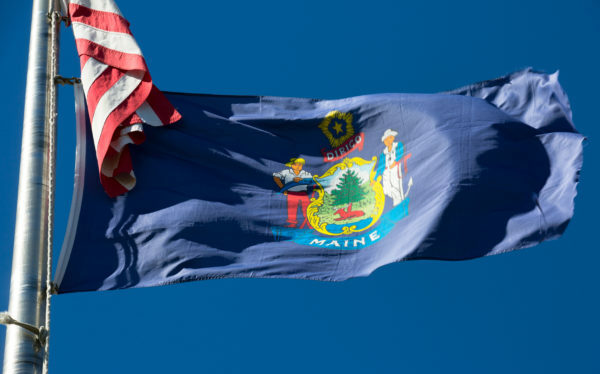 There are three important indicators to watch to see how Maine’s economy will perform. So far, the outlook is: not well. The economic indicators come from a recently released annual report by the Maine Development Foundation and Maine Economic Growth Council called Measures of Growth. Its purpose is to guide policymakers on where to focus their efforts, said Ryan Neale, the Maine Development Foundation’s program director. Actually creating a plan for how to improve the challenges described in the report is the subject of a bill, LD 367. It would provide funding for the council to create a long-range strategic economic improvement plan, which would be regularly reviewed and updated. The bill would also require the governor and Maine Legislature to consider the plan’s objectives when planning, administering or budgeting resources for programs that affect Maine’s economy. Fourth grade reading scores are a marker of how well students will progress later in their lives. “If young people are struggling at that point in life, that’s unfortunately likely to stay with them. At the same time, if they’re successful at reading at the fourth grade level, they’re more likely to be employed [and] more likely to command higher earnings,” Neale said. 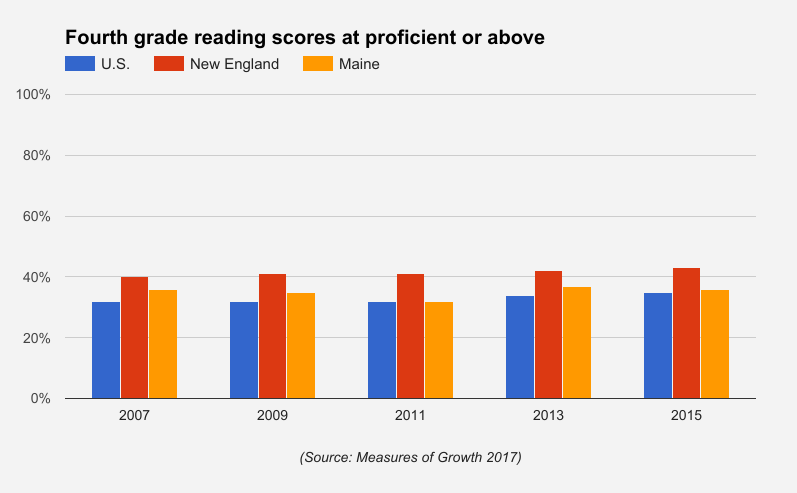 In 2015, 36 percent of fourth graders were proficient in reading, ranking the state 29th nationally, according to National Assessment of Educational Progress scores. Maine ranked last in New England. The goal set out in the report is to have 50 percent of fourth graders proficient in reading by 2020, but rates have been flat with little improvement. Maine has more people getting associate’s degrees but lower amounts of graduate and professional degrees than the U.S. and other New England states, according to the report. 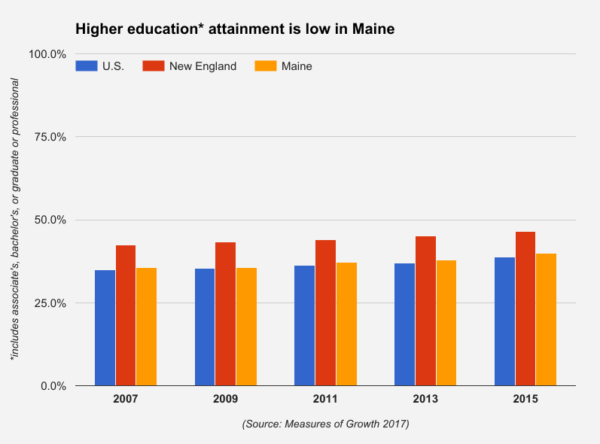 “Median earnings in Maine increase with each educational level, and additional education generally means that people are better equipped to deal with changing requirements in their jobs and changes in the economy as a whole,” Neale said. The goal listed in the report is for Maine to catch up to at least the New England average by 2020, which means it would have to improve higher education degree attainment at a significant clip. In New England, 46 percent of people had an associate’s, bachelor’s, or graduate or professional degree in 2015. With Maine’s aging population, the state needs to “engage both traditional students and adults,” according to the report, especially those with incomplete degrees. Without enough people with the right qualifications, businesses can struggle to find the right workers, and the economy can lag. “We’ve traditionally been a natural resource [and] manufacturing economy where folks could for a long time get by with a high school diploma, but as the expectation of workers are changing, we’re seeing more of a need for those higher levels of education,” said Neale. Maine is lagging behind not only other New England states but the country as a whole in terms of public investment in creating new products and technologies. And it doesn’t help that the biggest industries in Maine are not very research and development intensive, Neale said. “Investment in [research and development] supports innovation, which ultimately generates approximately 80 percent of all economic growth,” according to the report. It also supports the creation of new businesses. Maine’s total research and development funding of $596 million makes up about 1.1 percent of the state’s total gross domestic product as of 2014, placing Maine 37th nationally. The council’s goal is for Maine to reach 3 percent of gross domestic product by 2020. To do that, an additional billion dollars would be needed, Neale said. 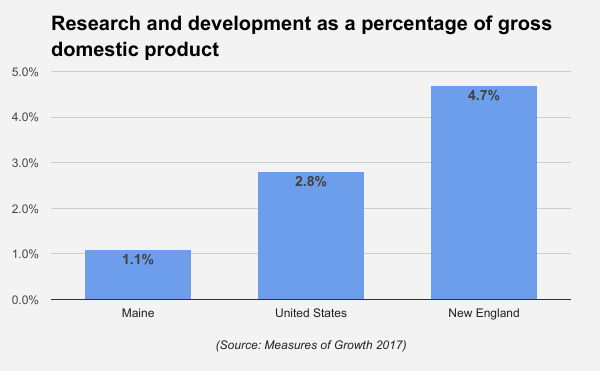 States that are economically similar to Maine — called EPSCoR states — spent about 1.6 percent of their gross domestic product on research and development in 2014, the last year for which data were available. While Maine ranked second in the nation in research and development in the nonprofit sector in 2014, the state falls behind in the private sector, Neale said. That year Maine ranked 32nd nationally in terms of technology and product innovations within private companies. Maine could invest more state funding to encourage private-sector innovation, Neale said. “A lot of the time, state funding isn’t necessarily the deciding factor for any type of investment decision, but it can tip the scales in favor of making an investment,” he said.